This is a card I have done for a lovely young lady that I am delighted to class as a friend. This image is from Saturated Canary and is called Fancy. 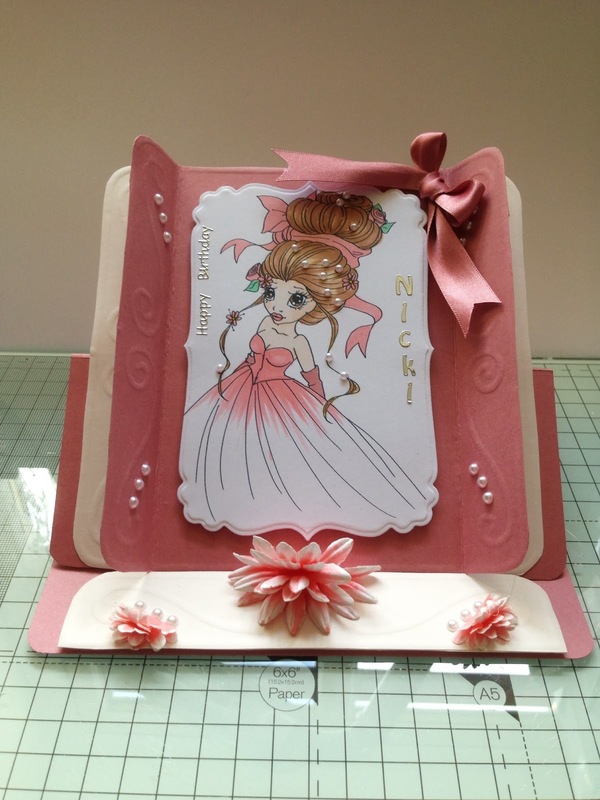 I coloured her with Flexmarkers and then cut her out by using a die from Spellbinders Labels 29. Next I made the base card for the easel with card stock from my stash. 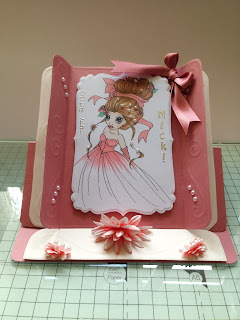 Next I used Glitter Girls Keepsake board called Radiance and embossed and cut out two pieces in different coloured card. I also embossed and cut out two extra pieces of the edging on this design and used them as the stopper. I embellished with paper flowers from my stash and coloured them in using the same colour of Flexmarker as her dress. I also used pearls which are from Chloe's Designs. Then finally I used peel offs and ribbon to finish it off. Any comments are truly appreciated whether good or bad. Hi Pat, Another great card i just love those images and you always put your cards together beautifully. Really pretty image, lovely colouring, great colours, great card!